We know now that his name was Aylan Kurdi. He was three-years-old. Yesterday, this harrowing image of Aylan’s lifeless body being carried from a beach in Turkey seized the attention of the world. Aylan and his five-year-old brother Galip drowned while trying to reach the Greek island of Kos from the Turkish resort town of Bodrum. Their mother, Rehan, also died. Only the boys’ father, Abdullah, survived.They were just two of at least a dozen migrants on a small boat fleeing the war in Syria. According to USA TODAY, Aylan and his family were Kurdish Syrians from Kobane, a town near the Turkish border, trying to emigrate to Canada. By one account, some 2,500 have died trying to cross the Aegean to reach Greece. The growing refugee crisis — with hundreds of thousands seeking to escape the bloodshed and turmoil in parts of the Middle East — has had a profound impact on many countries, with pressure increasing on European leaders to take action. In the meantime, the displaced in Iraq and Lebanon and Syria continue to turn to humanitarian agencies such as CNEWA, seeking help and hope. To learn what you can do for families such as the Kurdis in Syria, visit this page. This day, please remember them in your prayers. Remember Aylan Kurdi, and his brother Galip, and their mother Rehan, and so many others whose names we do not know who have lost their lives seeking sanctuary and a better life. The faithful celebrate the liturgy at the Church of St. Nicholas in Kampala, Uganda. African Christianity has apostolic roots. St. Mark the Evangelist brought the Gospel to the Egyptian city of Alexandria — second only to Rome in the ancient world — and established a church there as early as A.D. 42. Though sporadically persecuted by the Romans — Mark died a martyr’s death around A.D. 67 — the Alexandrian church blossomed. It provided the universal church with the philosophical foundation and theological vocabulary responsible for its explosive expansion, introduced variants of monastic life and peopled the Christendom with some of its greatest saints and scholars. The Alexandrian church was not confined to cosmopolitan Alexandria. Its bishops, who still hold the title of “pope and patriarch of Alexandria and all Africa,” had jurisdiction throughout the African continent: the churches of Eritrea and Ethiopia, for example, are daughter churches. But as the Egyptian church grew, cultural and linguistic differences — especially between the Copts and Greeks — divided the church. Rival parties struggled to secure the papal see of Alexandria. Finally, in 567, the Byzantine emperor recognized two claimants: the Copt, to whom the vast majority of Egypt’s Christians owed allegiance, and the Melkite (from the Syriac, meaning of the king), who led the Greek-speaking minority. Scholars believe that by the eve of the Muslim Arab invasion in 641, Alexandrian Christians included up to 18 million Copts and some 200,000 Melkites, mostly Greek-speaking bureaucrats, merchants and soldiers. Both churches used the distinctive rites of the Alexandrian church. The Copts, however, adapted these liturgies for monastic use, which survive to this day. Eventually, the Greek-speaking church replaced these ancient rites with those from the Byzantine capital of Constantinople. After the Arab Muslim occupation of northern Africa, Egypt’s Greek-speaking Christians suffered for their loyalty to Byzantium. Their numbers declined. Until the middle of the 19th century, most of the Greek Orthodox men who held the title of pope and patriarch of Alexandria lived in Constantinople and were appointed by the ecumenical patriarch. Yet in the 19th century, the situation changed as Orthodox Christians from Greece, Lebanon and Syria began to settle in cities throughout the African continent. There, they built churches as their communities grew in size and wealth. The port city of Alexandria drew tens of thousands of Orthodox emigrants, particularly as Egypt won a form of autonomy from Great Britain. By the 20th century, the British estimated that nearly 200,000 Greeks lived in Egypt. Flush with assets, the Greek Orthodox popes and patriarchs of Alexandria gained considerable influence in Egypt and beyond. Until the middle of the 20th century, Orthodoxy’s reach throughout “All Africa” ended at the Sahara. The story of how it penetrated the continent, to Kenya and Uganda in particular, is not the familiar one of European missionaries and colonizers. Rather, it began as a spontaneous movement by African Christians seeking a form of Christianity untainted by European colonization with roots in the early church. To learn more about this African church, click here. Pope Francis meets with Israel’s President Reuven Rivlin in the Vatican. As with most Christian communities of the Middle East, the Syriac Catholic Church has suffered severely as the region’s stability has deteriorated in the last 100 years or so. During Iraq’s civil war (2006-2007), thousands fled the violence in Baghdad and Mosul, where they had once enjoyed relative prosperity. The displaced found security in their remote ancestral villages near ancient Nineveh. Now, these once proud centers of the church — the source of many of its vocations to the priesthood and religious life — have been lost, too, as Islamic extremists invaded the Nineveh Plain in August 2014, displacing more than 100,000 Christians, as well as Yazidis and other minorities. Civil war in Syria has uprooted thousands more, while economic stagnation and political uncertainty in Egypt and Lebanon have encouraged some Syriac Catholic families to emigrate to the West. A small church, numbering about 207,000 people worldwide, the Syriac Catholic Church somehow endures, despite the repeated conflicts and cycles of persecution in the last 120 years. Together with the much larger Syriac Orthodox Church (which numbers some 4.2 million people, including 3.7 million in India), the Syriac Catholic Church shares in the heritage of the Syrian city of Antioch, the political and socioeconomic center of the eastern Mediterranean in the ancient world. Though inhabited by a diverse population — Greeks and Macedonians, Romans and Jews, Syrians and Nabateans — Antioch was culturally Hellenic and its lingua franca, Greek. But those who lived in Syria’s rural interior spoke Syriac, a dialect of Aramaic nurtured in the city of Edessa. In the seventh century, Syriac Christians generally welcomed the invading Muslim Arabs, who accepted them as “People of the Book.” Syriac Christianity flourished. Poets composed hymns that simplified complex ideas. Scholars translated ancient Greek texts and wrote biblical commentaries. Monks explored grammar, medicine, philosophy, rhetoric and science. Theologians and poets continued the tradition of creating liturgies, borrowing elements from the Byzantine and other traditions. Arab Muslim leaders employed Syriac scholars, who were largely responsible for the Arab world’s familiarity with ancient Greek astronomy, chemistry, mathematics and philosophy — disciplines that eventually reached Europe via Arab Sicily and Spain. In the 18th century, a renewed Catholic presence in the Middle East, bolstered by the presence of French and Italian missionaries, formed a Catholic community within the Syriac Orthodox Church. The growth of this new church ended, however, as the long and painful decline of the Ottoman Turkish Empire coincided with the rise of European colonial ambitions. Suspicious of collusion, the Ottomans murdered more than 25,000 Syriac Christians between 1895 and 1896. During World War I, the Christian subjects of the Ottoman sultan were caught between two opposing cultures — their Sunni Muslim superiors and the Allied “Christian” powers of Great Britain, France and Russia, which encouraged separatist movements. The consequences were grave. Hundreds of thousands were killed, including some 50,000 Syriac Catholics and six of the church’s bishops. Survivors, including the patriarch, sought refuge in cities, especially Beirut, which remains the seat of the Syriac Catholic patriarchate. 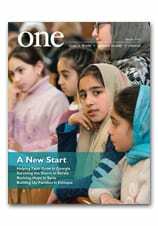 Click here for a full account from the pages of ONE magazine. In this image from 2007, a teacher leads a class at the Holy Trinity College in Addis Ababa. The college hosts both full-time and part-time students (there are currently about 400 enrolled) and offers a bachelor’s degree in theology, a diploma of theology and a certificate in church management and administration. There are courses also found in secular institutions — foreign languages, statistics, philosophy and sociology — as well as classes in theology, liturgy and other areas of religious studies. Many of the students have been educated previously in government schools. “From first to twelfth grade, I went to government schools,” said Mulugetta Dabi, a fifth-year student in his final year at Holy Trinity. By the time he was in sixth grade, he knew he wanted to be a priest in his hometown of Nazret, so he came to Holy Trinity. When they graduate, most students scatter across the country, often serving parishes in small villages. A few stay on and teach at Holy Trinity. The new generation of students will not only enliven the church at home, but will also help forge ties abroad, Mr. Dabi said. Read more about Ethiopians moving “Into the Future” in the November 2007 edition of ONE.